The remnants of Tropical Storm Lee deluged us today. It amused me to hear the weather forecasters describing it as the “remnants” because we received three times as much rain as Hurricane Irene delivered last week. The bands of rain were steady, but during a few breaks I walked around the yard to check out the scenery. Beautiful macro shots were everywhere, from the rain drops dripping from the branches, to the glistening spider webs to the reflections in the standing water. With rain forecasted for the rest of the week, it will be a perfect opportunity to explore the macro world in even more detail. Nice shot Tricia…we are having the same weather here SE Pa. Checked out your website…Beautiful photography. Thank you, David! I checked out your blog, too. Wonderful work! 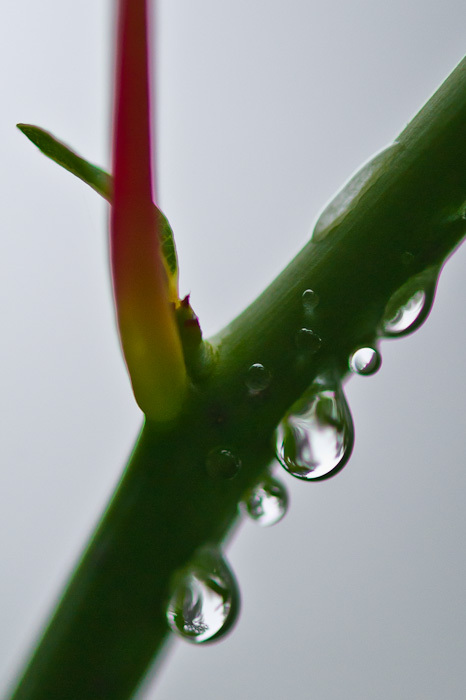 The rain continues again today, so I’ll be working on macro again this afternoon. Love this, Tricia! I’m always drawn to botanicals and critters of all kinds. We got almost 4 inches from the ‘remnants’. But we really needed the rain. Thank you! I had fun with the raindrops…we also had a lot of them. We needed the rain, as well. But I am ready for some sun this weekend! I appreciate your comments, Nia! I used to avoid the rain, and now I like it for this reason. Lots of beauty in the drops.